Try other fruits such as plums depending on what is in season. You can also use the poached rhubarb and strawberries as a topping with porridge or yoghurt (natural or greek). Rhubarb freezes really well, just wash, chop and pop in a freezer bag. Traditionally, a pannacotta is turned out on a plate. I prefer to serve it in a short whiskey or brandy tumbler glass. Add the rhubarb, strawberries and sugar plus a spoon of water to a saucepan and cook over a medium heat until the rhubarb is soft. This will take about 10 minutes. For the pannacotta, soak the gelatine leaves in a small bowl of cold water for 10 minutes. Cut the vanilla pod in half lengthways and scrape out the seeds. Put in a large saucepan along with the empty vanilla pod, buttermilk, double cream and caster sugar. Bring to the boil slowly and remove from the heat. Remove the gelatine leaves from the water and squeeze gently to remove excess water. Add to the pannacotta mix and whisk until the gelatin is combined. Pour the mixture into a jug, removing the vanilla pod. You can strain the mixture through a sieve to remove some of the vanilla seeds. Pour the mixture equally into the glasses, leave to cool and place in the fridge (covered with clingfilm). They will need 2 – 3 hours to set but can be made in advance and kept in the fridge for 2 days. 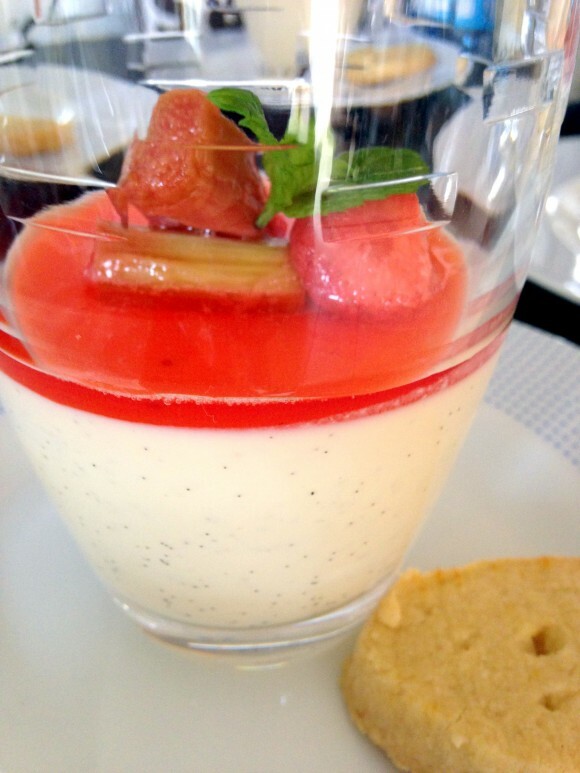 To serve, remove the pannacotta from the fridge and clean any condensation from the glass. Top with the poached rhubarb mix and a sprig of mint if desired.